We didn't have enough players sign up for this scenario last week. Let's try again this weekend. The French were beset with a piece of bad luck. Movement orders for II corps had been intercepted. The Austrian high command sent out a large force to take advantage of this opportunity and destroy the enemy. However, due to the all too usual slow movement of the Austrians, the French may be able to slip free. To succeed, each army will need to out guess and out maneuver his opponent. This 3 hour battle will be fought on the Pipe Creek 3 map. The usual 3 mods will be required along with the Pipe Creek expansion pack sold by Matrix, (everyone who has played for the last month already has it). The battle will require a minimum of 8 players. We can, of course, accommodate many more with brigade assignments. The usual rule of no scouting more than 200-250 yd in front of your troops is in effect. Cavalry and artillery may only use the roads when moving across the central ridge or along it. They may not move cross country. There are only two roads which allow such movement across, marked in red. Roads near the top of the ridge that allow travel NE_SW, also marked in red. These restrictions only apply to the central ridge. I take it that we'll play this one tomorrow... and plans for tonight? Correct. Mark, the French CinC can only make Sunday, so we'll play the scenario tomorrow at 19:30BST. I'll throw something together for today on the Brandy Station map. Everyone will need that expansion pack. The game will start at the usual time 20:00BST, (15:00EDT, 14:00CDT, 13:00MDT, 12:00PDT). 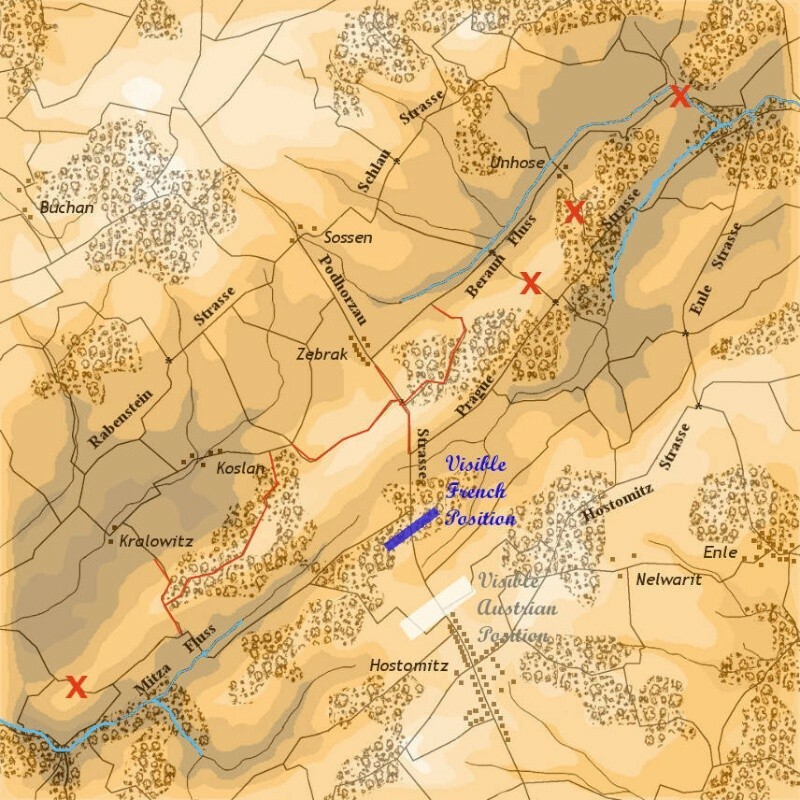 Our Brandy Station fights tend to always take place in one of two areas (south or west), is it possible to arrange some action elsewhere on the map please? I know the river closes off one big chunk but perhaps something based on forcing a river crossing? I did not get the Brandy Station map this month. Had to get my Grandson a new medicine. Along with banking restrictions I can't move money from a to b quick enough. Enjoy the game! Paypal is convenient but when you have a PayPal foreign account it will not let you transfer money from the US to it. Curse you Patriot Act!!! Should have tried this before today! it's 6:17 PM here right now - so... I take it we are about to start the battle? or to put it in the proper 3rd Dynasty way: the 6th cycle of the dog has just crossed over the Nile and has met with the 2nd cycle of the holy cat. The battle will be for the town of Paysdorf. Prussians vs French. Austria is on Central Euro time? If so you are BST+1. I am on Mayan Equinox Sacrifice Time. As I need to ritualistically slaughter a healthy youth before we march to fight I need to know the moon phase, where Altair is in relation to Vega and the texture of the chicken's entrails before I can say whether I'll be attending or not. If I get this wrong we all know the world will end in 2014.
anyone know how the Mongolian cycle of the sheep works? That is a loaded question Roland! Pretty much like any other sheep event I think. "Doo do doo do doo do do doo..."